Coastal areas are generally densely populated and marked by high freshwater demands. Due to the proximity of the sea these areas have to deal with saline water intrusions and salinization of groundwater. Therefore the availability of freshwater cannot always be guaranteed in these regions. Use of local ecosystems by aquifer storage and recovery (ASR) of temporary freshwater surpluses and reverse osmosis (RO) of brackish-saline groundwater are potential solutions for freshwater supply in coastal areas. Both techniques have their drawbacks. ASR in coastal aquifers is marked by freshwater losses by buoyancy effects in the saline groundwater, while RO is accompanied by a saline waste water stream. In DESSIN we aim to demonstrate that a sustainable and reliable freshwater supply can be achieved by combining both techniques in one system (ASRO). 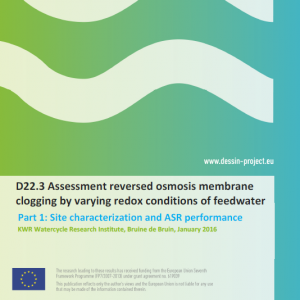 In this report we discuss the potential increase in freshwater recovery by deploying multiple partially penetrating wells (MPPW), a Freshkeeper, and a combination of ASR and RO (ASRO).